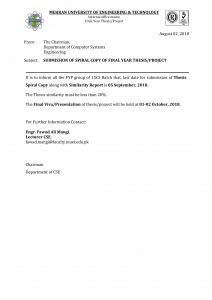 It is to inform all the FYP group of 15CS Batch that, last date for submission of Thesis Spiral Copy along with Similarity Report is 05 September, 2018. The Thesis similarity must be less than 20%. The Final Viva/Presentation of thesis/project will be held at 01-02 October, 2018.